Critical Theory and Performance presents a broad range of critical and theoretical methods, and applies them to contemporary and historical performance genres - from stage plays, dance-dramas, performance art, cabaret, stand-up comedy, and jazz to circus, street theater, and shamanistic ritual. 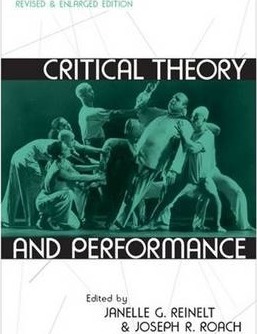 As the first comprehensive introduction to critical theory's rich and diverse contributions to the study of drama, theater, and performance, the book has been highly influential for more than a decade in providing fertile ground for academic investigations of the lively field of performance studies. The revised edition presents sixteen new essays by the field's leading critics and practitioners, reflecting recent trends in performance studies and paving the way for future work. The essays are organized into nine theoretical categories (Performance Analysis, Postcolonial Studies, Critical Race Theory, History and Historiography, After Marx, Gender and Sexualities, Psychoanalysis, Performance Studies, and Mediatized Cultures), each contextualized with an introduction by editors Janelle G. Reinelt and Joseph R. Roach. The resulting volume is a unique and indispensable tool for scholars, teachers, and students. "Critical Theory and Performance signals the self-empowered emergence of theatre and performance studies into the broader fray of contemporary scholarship... a first-of-its-kind resource which many scholars will keep close at hand and which future graduate students would do well to consider required reading for programs in theatre history, dramatic criticism, or performance studies." Janelle G. Reinelt is Associate Dean in the College of Fine Arts at the University of California, Irvine. She is author of After Brecht: British Epic Theater. Joseph R. Roach is Charles C. & Dorathea S. Dilley Professor of Theater and Theater Studies and African American Studies, Yale University. His book Cities of the Dead: Circum-Atlantic Performance won the James Russell Lowell Prize from the Modern Language Association. He is also author of The Player's Passion: Studies in the Science of Acting.